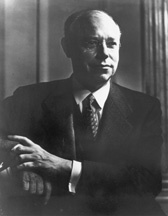 Robert Alphonso Taft (September 8, 1889 - July 31, 1953), scion of the Taft family of Ohio, was a Republican United States Senator and as a prominent conservative spokesman was the leading opponent of the New Deal in the Senate from 1939 to 1953. He led the successful effort by the Conservative coalition to curb the power of labor unions. He failed in his quest to win the Presidential nomination of the candidate of the Republican Party in 1940, 1948 and 1952. Taft was the grandson of Attorney General and Secretary of War Alphonso Taft, and son of President William Howard Taft. As a boy he spent four years in the Philippines, where his father was Governor-General. Known throughout his life for his brilliant grasp of complexity, he was first in his class at the Taft School (run by his uncle), at Yale College (class of 1910) and at Harvard Law School (class of 1913), where he edited the Harvard Law Review. After finishing first in his class at Yale and Harvard Law School, he practiced for four years with the firm of Maxwell and Ramsey in Cincinnati, Ohio, his family's base. After a two-year stint in Washington, working for the federal Food Administration, he returned to Cincinnati, opened his own law office, and ran and was elected to the state legislature. In 1924, he and his brother Charlie helped form the law partnership Taft, Stettinius, and Hollister. In 1914, he married Martha Wheaton Bowers, the heiress daughter of Lloyd Bowers, who had served as his father's solicitor general. Taft himself appeared taciturn and coldly intellectual, characteristics that were offset by his gregarious wife, who served the same role his mother had for his father, as a confident and powerful asset to her husband's political career. They had four sons including Robert Taft Jr. (1917-1993), who was elected to the Senate; Horace Dwight Taft, who became a professor of physics and dean at Yale; and William Howard Taft III (1915-1991), who became ambassador to Ireland. Taft's grandson Bob Taft was the Governor of Ohio from 1999-2007. Rejected by the army for poor eyesight, in 1917 he joined the legal staff of the Food Administration, working for Herbert Hoover who became his idol. In 1918-1919 he was in Paris as legal adviser for the American Relief Administration, Hoover's agency which distributed food to war-torn Europe. He learned to distrust governmental bureaucracy as inefficient and detrimental to the rights of the individual, principles he promoted throughout his career. He distrusted the League of Nations, and European politicians generally. He strongly endorsed the idea of a powerful World Court that would enforce international law, but no such idealized court ever existed during his lifetime. He returned to Ohio in late 1919, promoted Hoover for president, and opened a law firm with his brother Charles Phelps Taft II. In 1920 he was elected to the Ohio House of Representatives, where he served as Speaker of the House in 1926. In 1930 he was elected to the Ohio state senate, but was defeated for reelection in 1932. As an efficiency-oriented progressive, he worked to modernize the state's antiquated tax laws. He was an outspoken opponent of the Ku Klux Klan; he did not support prohibition. Taft was elected to the first of his three terms as U.S. Senator in the election of 1938. Cooperating with conservative southern Democrats, he led the Conservative Coalition that opposed the "New Deal." The expansion of the New Deal had been stopped and Taft saw his mission to roll it back, bringing efficiency to government and letting business restore the economy. The New Deal was "socialistic" he proclaimed, as he attacked deficit spending, high farm subsidies, governmental bureaucracy, and the National Labor Relations Board. He did support social security and public housing, while attacking federal health insurance. Taft set forward a conservative program oriented toward economic growth, individual economic opportunity, adequate social welfare, strong national defense, and non-involvement in European wars. As a leader of the Old Right isolationist wing of the GOP he strove to keep the United States neutral during 1939-1941, and opposed the draft. He supported the general principles of the America First Committee but did not join it. However he strongly supported the war effort after the Japanese attack on Pearl Harbor. When the Republicans gained control of Congress in 1946, he focused on labor-management relations as chair of the Senate Labor Committee. Decrying the effect of the Wagner Act in tilting the balance toward labor, he wrote and passed over Truman's veto the 1947 Taft-Hartley Act; it was strengthened in 1959 and remains the basic labor law as of 2008. It bans "unfair" union practices, outlaws closed shops (where only union members can be hired), and authorizes the President to seek federal court injunctions to impose an eighty-day cooling-off period if a strike threatened the national interest. Taft was reluctant in his support of farm subsidies, a position that hurt the GOP in the farm belt. Moving a bit to the left, he supported federal aid to education (which did not pass) and cosponsored the Taft-Wagner-Ellender Housing Act to subsidize public housing in inner cities. Berger (1967) rejected the idea that Taft was an "isolationist." Taft was rather a "conservative nationalist at odds with the struggling attempts of liberal American policy-makers to fashion a program in the postwar years." Taft profoundly believed in the exceptionalism of America and its people, and argued the "principal purpose of the foreign policy of the United States is to maintain the liberty of our people." Taft identified three fundamental requirements for the maintenance of American liberty-an economic system based on free enterprise, a political system based on democracy, and national independence and sovereignty. All three, he feared, might be destroyed in a war, or even by extensive preparations for war, so he did not see Stalin's Soviet Union as a major threat to American values. Nor did he pay much attention to internal Communism. The true danger he said was big government and runaway spending. He supported the Truman Doctrine, reluctantly approved the Marshall Plan, and opposed NATO as unnecessary and provocative. He consistently opposed the draft and took the lead condemning President Harry S. Truman's handling of the Korean War. Taft sought the GOP nomination in 1948 but it went to his arch-rival, Governor Thomas E. Dewey of New York. Taft relied on a national core of loyalists, but had trouble breaking through to independents, and hated to raise money. Taft tried again in 1952, using a strong party base. He promised his supporters that he would name Douglas MacArthur as candidate for Vice President, but was defeated by charismatic Dwight Eisenhower. To gain Taft's support in the campaign, Eisenhower promised he would take no reprisals against Taft partisans, would cut federal spending, and would fight "creeping socialism in every domestic field." All along Eisenhower agreed with Taft on most domestic issues; their dramatic difference was in foreign policy. Eisenhower firmly believed in NATO and committed the U.S. to an active anti-Communist foreign policy. Taft served as Senate Majority Leader in 1953, as he strongly supported Eisenhower's domestic proposals. He became ill with cancer in April 1953, and died at the age of 63 and is buried at in Cincinnati. In 1957, a committee led by Senator John F. Kennedy selected Taft as one of five of their greatest Senate predecessors whose oval portraits would adorn the President's Room off the Senate floor. Kennedy profiled him in his book Profiles in Courage. The Robert A. Taft Memorial is a memorial dedicated to Taft with a statue and bell tower and located near the Capitol building. The U.S. Senate in 1959 honored him as one of the five greatest senators in history. Wunderlin, Clarence E. Robert A Taft: Ideas, Tradition, And Party In U.S. Foreign Policy (2005). Kirk, Russell and James McClellan, eds. The Political Principles of Robert A. Taft (1967). Wunderlin, Clarence E. Jr., et al. eds. The Papers of Robert A. Taft vol 1, 1889-1939 (1998); vol 2; 1940-1944 (2001); vol 3 1945-1948 (2003) online edition; vol 4, 1949-1953 (2006). ↑ See John Moser, "Principles Without Program: Senator Robert A. Taft and American Foreign Policy," Ohio History, (1999) 108#2 pp. 177-192. This page was last modified 23:59, 7 April 2008.